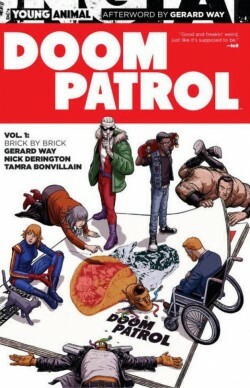 * Matthew Wells on Doom Patrol Volume One: Brick By Brick. * Desireé Guerrero profiles Amanda Deibert and Cat Staggs. Sam Thielman profiles Gary Panter. * Comic-Con articles: Variety has a trends article, although I'm not sure what they're describing are actually trends as I think of them. This CNN digital-arena article sorts through the idea the proliferation of on-line resources to see and hear things has damaged CCI's ability to be a repository of pop-culture reveals. I'm not sure it has, and in a broader sense I'm not sure it matters. The LA Times has a feature that manages to fold in the story of Chuck Rozanski bailing on the show, which is admirable, but there's very little questioning of that story. Mile High is a major retailer but their replication on the convention floor of what you can buy anywhere in the country the other 360 days of the calendar year seems to me like it was doomed to eventually fail. Unlike the post Rory Root loss of Comic Relief, where that store allowed access to books featured on panels and in awards shows, I can't imagine Mile High being gone having much of an effect on the floor itself. It's symbolic, for sure, though. * finally, this article on Marvel's forthcoming plans outside of and within their Doctor Strange comic interested me for how explicit it is about the next big plot shift. There was something really weird about the latest version of the comic since its initial issues, in that there was very little narrative compulsion to keep the comic going once the latest concept was unpacked.